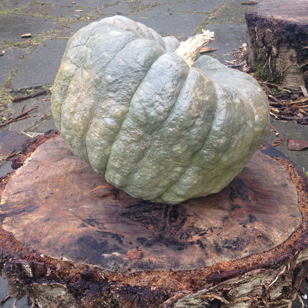 The last of the Autumn/Winter Squash collection from Herbivore Acres makes its way to the Embassy Cafe menu this week. Keeping it local with more lovely leaves from the Cardiff Salad Project that I’ve mentioned before. Full menu here. The last two venues for Herbivore supper clubs were a bit of a hit so why not go back to both for Christmas? Thursday 14th December sees us back at the Fig Tree in Penarth – once again 5 courses of seasonal vegan cuisine, with bookings from 6pm. Then it’s on to the Blue Honey Night Cafe on Tuesday 19th December at 7pm for a one sitting 5 course feast with a slightly different menu. Menus and more details here. If it wasn’t for those pesky birds.. Sorry to say there will be no supper club in July. Last week’s sell-out Twisted Bistro was a big success but there’s just too much other stuff to fit in next month. Herbivore will be on the road again – this time up to MOMA in Machynllteh for a one-night-only “culinary intervention” at ceramicist Lisa Krigel’s exhibition on Thursday 27th July. More details on that coming soon. Watch this space for details of the next Cardiff event too. After three lovely weekends away cooking and eating my way around the beautiful island of Sicily, Herbivore is now back in town and will be at the Embassy Cafe, Cathays Terrace, Cardiff from 11 – 5 on Saturdays and Sundays. Managed to fit a bit of the good stuff, the high grade Sicilian olive oil , in my baggage so look out for some Italian – inspired dishes coming your way. Watch out for details of upcoming supper club dates and other special events on the horizon. Starting from 15th Jan Herbivore will be operating at the Embassy Cafe on Cathays Terrace every Sunday so you’ll now have two opportunities to sample the ever changing menu of vegan and vegetarian lunches, brunches and sweet things. We’re open 11 – 5 on both days and not currently taking bookings as the space is so small – but do give me a shout if you’re planning to come as a group: it’s useful for me to know and I can do my best to make sure there’s somewhere to sit and something left to eat. No supper clubs planned for the next two months at Kemi’s but watch this space for any other upcoming events. We’re going to be seeing off the old year and welcoming in the new with a menu of tapas-style small vegan & vegetarian plates at the Embassy Cafe. We’re kicking off at 6pm so you can just drop in for a drink and a bite before heading off to crazy party land. Alternatively, grab a bottle of wine or two and settle in for the night. We’re not taking bookings as it’s not a set a meal – just order as much or as little as you like – but drop me a line if you’re planning to come to give me an idea of numbers. It’ll be a BYO night with a small corkage charge. Food menu coming very soon. Herbivore at the Embassy cafe for the usual round of brunch, lunch & sweet treats Saturday 11 – 5. Won’t be there on Christmas Eve but back for New Years Eve with a special small plates menu running in the evening until late. More details coming soon. This weekend sees us team up with the wonderful Riverside Sourdough to create a special menu we’ll be running from 11 – 5 on Saturday & Sunday at the Embassy Cafe. Menu here. The weekend of the 3rd & 4th December sees Herbivore teaming up with Riverside Sourdough to create a special brunch and lunch menu to showcase perhaps the best bread available in Cardiff right now. Organic, handmade and bloody delicious. Everything will be freshly baked on the day – no menu details yet but expect things on toast, a sandwich or two, brioche, ice cream and croissant. More details about Riverside Sourdough and their products here. The menu will be on offer for the usual Herbivore Embassy ours of 11 – 5 on both Saturday & Sunday. This one’s a la carte rather than supper club style so no need to book.